LG HB954PB review | What Hi-Fi? Do you ever come up against a brick wall when explaining your love for AV? Not everyone grasps the joy to be had from a sweet-sounding home entertainment set-up. This LG system, however, can be sold in an instant to the average person on the street. If you're looking to turn your front room into a multi-media AV portal, the LG HB954PB can do that in one fell swoop. 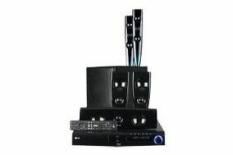 The main unit combines the functionality of a Blu-ray player, AV amp and iPod dock. It can deliver 1080p/24fps video and decode HD audio, and upscale DVDs to 1080p. You'll find two HDMI inputs and one output to allow you to connect other sources to take advantage of the LG's amplification and speakers. The iPod dock is joined by an AM/FM receiver on the exhaustive list of functions. There's an Ethernet connection too, flagged up by the YouTube button on the home menu that gives you direct access to streaming content using your home network. You can also access BD-Live content once connected. The main unit itself is fairly chunky but considering the functionality inside we can allow it some slack. The speakers are more lithe, with two champagne-flute-style floorstanders at the front, a small, dedicated centre channel, two compact rear satellite speakers and a block of a sub. Once set up, we fire-up Vegas romp, 21, and enjoy the Dolby Digital True HD soundtrack. The subwoofer is quite pedestrian, but there's plenty of weight and power when required, and the system has no problem filling the room with fairly detailed sound, though cohesion between the floorstanders and rears could be better. Moving images look good, too, with only a slight smear to motion during the frantic X-Men Origins: Wolverine. The upscaled DVD of No Country For Old Men is stable, too. There's plenty to like here, not least in terms of thethe functionality, which, with two HDMI inputs, is unrivalled. There are tiny holes to be found in the level of performance but this system remains a tempting proposition.